ericgarland @realDonaldTrump Guy elected Senator at 29 versus guy struggling to make a four-year term without 728 convictions. Place your bets! 22 hours 52 min ago. Some photos of the truly wonderful night of The Hope Etudes at Middle Church. We had a “sold out” (it was free) standing room crowd for this first listening of the new music! What a warm circle of good energy the audience created. Pictured here: my band The Katie Bull Group Project, with our new incredible pianist Mara Rosenbloom joining players I’ve been working with for over ten years: Joe Fonda on bass (20 years! ); George Schuller, drums (at least 11 years! ); and Jeff Lederer, saxophones (13 years!) Now that’s ensemble!! Some of my NYU/Atlantic voice alumni and current undergrad students, ATC Evening Conservatory students, and my voice coaching protege Quentin Lee Moore! And my painter-mother Fran Bull and son, Hudson! Not pictured are so many old and new friends, brilliant dancers, musicians, filmmakers, social workers, writers, teachers, and long time jazz listeners who are tending the flame. Foods by Frank’s Market. Flowers by Anthony. :-D Gratitude for circles of friendship that manifest music, and music that fosters circles of community! Community = Hope xo 2 months 3 weeks ago. <3! 5 months 1 week ago. 10 months 1 week ago. Hey Singers, As a certified Associate Fitzmaurice Voicework (c) coach, I am honored to be conducting the jazz segment in this five-day cross-genre Fitzmaurice Voicework (c) singing workshop in Manhattan! Join the wonderful Fitzmaurice Voicework (c) integrative singing explorations in August; they culminate in a performance of shared song! Sing up now - I mean, sign up now :-P xo KB 11 months 1 week ago. 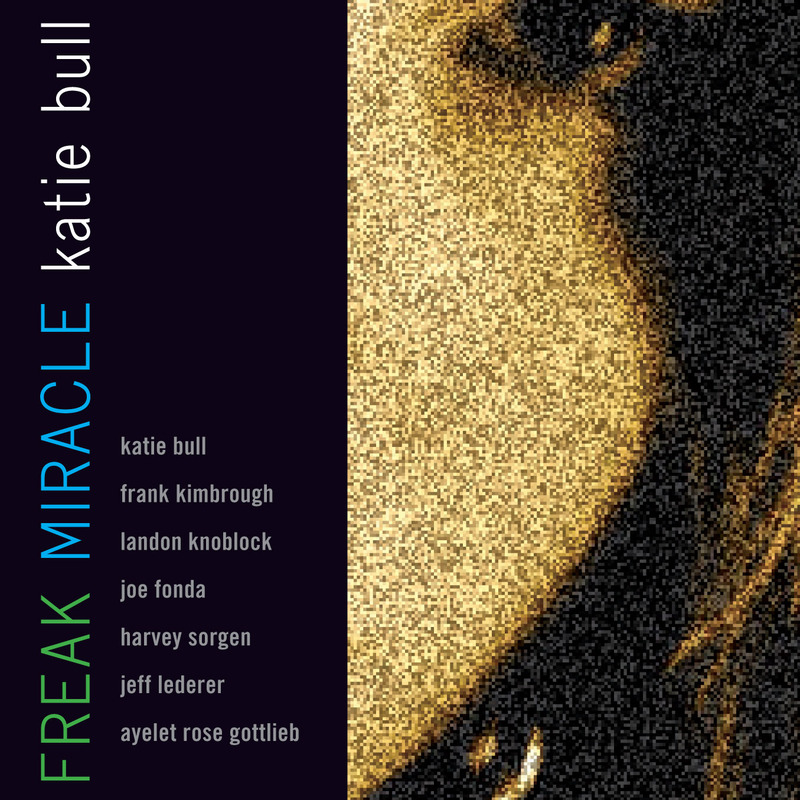 With little regard for the bright lines that have long separated experimentation from tradition—and even vocal from instrumental—in jazz, vocalist/composer/band leader Katie Bull harnesses the accidental, the inspired, the carefully composed and the spontaneous into a challenging, seductive whole on her innova Recordings debut, Freak Miracle. Her flexible, powerful, soulful ensemble is granted remarkable freedom by Bull and the resulting record is a wild ride that takes what you know about jazz vocals through the looking glass and down the rabbit hole. “My group project musicians play in and out with equal strength,” says Bull. “And bold passion—I might add—which is why I chose them. The chart is just a blueprint to be transformed. We take the ride.” At the front of that freewheeling caravan is Bull herself, straddling swing, bop, bossa, and completely abstract forms, drawing on everything from the poetry of human conversation to fragments of melodies and snatches of lyrics from dreams. Bull’s “envelope pushing experimentation on a grand scale” (Christopher Loudon, JazzTimes) has earned her critical respect over the course of five independent releases. Freak Miracle is her most ambitious record yet, spanning a wild yet cohesive musical landscape of eleven new original works and three vital re-imaginings of jazz standards (“I Thought About You,” “How Insensitive,” and “Let’s Call the Whole Thing Off”). This ability to stay grounded in tradition while leaping boldly into the future was instilled in Bull by her mentors—her “jazz mothers”—Sheila Jordan (for whom she wrote “Back to Square One”) and Jay Clayton (to whom she dedicates “I Thought About You”). Hailing from New York’s Greenwich Village, Bull grew up in a house of jazz with her pianist father (a student of Lennie Tristano) taking her to gigs and jam sessions across the city. Family friends like Borah Bergman, Elliott Sharp, Jane Ira Bloom, Lou Grassi and Meredith Monk circulated through her world, steeping in her not only in the world of jazz but of experimentation and exploration. It is with that spirit that she formed her Group Project, an ensemble capable of a seamless blending of improvisation and structure, a total confluence of impulse and collaboration where the lion of edgy dissonance lies down with the lamb of comforting forms and structures. Bull herself is not afraid of being straightforward when it’s called for, nor is she timid when it comes to cracking it open and going crazy. Freak Miracle is much more than a simple collection of songs—it’s a manifesto, a declaration that the destination means nothing without the glorious winding ride it takes to get there. Please note that the track listing, through a freakish set of events, was printed in the wrong order. The song, Removed, (indicated as Track 8 in the printed notes) should appear as Track 12, as above. "...attempting to categorize the native New Yorker, and a leader of the city's inter-arts movement, is rather like trying to get a few dozen wriggling snakes to lay orderly and still...envelope pushing experimentation on a grand scale...a dazzling voyage..."
"...a consistently intriguing singer...utterly unpredictable...never playing it safe...taking wild chances...stretching herself..."
"Katie Bull likes to pick you up with her SuperSonic Trailways bus and then drop you off in a very wild part of town. You may be disoriented and perhaps a bit scared but you know you are going to have a groovy time. You always meet nice folks also." "...a textbook example of how effectively a jazz vocalist can integrate elements of the inside and the outside ... consistently musical ... consistently expressive, not to mention individualistic ... her individuality really comes through on 11 originals as well as on highly personal interpretations of George Gershwin's "Let's Call the Whole Thing Off", Jimmy Van Heusen's "I Thought About You", and Antonio Carlos Jobim's "How Insensitive" ... (Bull) manages to keep things as intriguing on the standards as she does on the originals which range from the moody "Blue Light and the blusey "An Opportunity" to the Sun Ra-ish "Road Trip". Bull has her influences ... the cool-toned introspection of June Christy and Helen Merrill ... experimentation of Betty Carter, Jeanne Lee, and Sheila Jordan ... But ultimately Katie Bull sounds like Katie Bull. And her sense of adventure serves her well throughout FREAK MIRACLE." "[Katie Bull] knows the art of torch singing, yet she knows out not to follow it too closely … Her lyrics are delicate and elegant … There a few standards here, but the real deal is Bull’s compositions: poignant songs that, occasionally, take a few steps left of the norm. Beautiful, masterful jazz music, from a unique singer-songwriter." "The stars of the show are Katie Bull's voice and her intelligent concept of a modern jazz. This is music with freedom and with a stretch of the vocalist-with-improvisers tradition. There's effective accompaniment, Lederer sometimes playing Prez to her Lady Day, for example. "Katie Bull has a voice that carefully enunciates the lyrics (Carmen McRae used to do that especially well) and there is plenty of nuance and improvisational variation going on too. Her voice is attractively breathy or ringingly downright as she feels the music. And she hits notes and phrases with the confidence and imagination of what a jazz musician is supposed to be about. "The music flows consistently and attractively from her throat and the various appendages/sounding-methods of her fellow musicians. If you want a modern-day vocal disk that puts a fresh face on the genre, Freak Miracle will give you that."